It took just twelve hours for Curry, an 18-month-old Corgi, to go from perfectly healthy to being extremely lethargic and unable to stand on his own. His owners quickly brought him into Friendship, where it was up to the hospital’s emergency staff to figure out the reasons for Curry’s sudden illness. 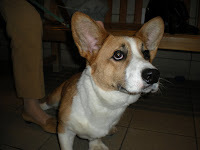 According to his owners, Curry had been fine the previous night and ate dinner well. When they found vomit in his crate the next morning, they didn’t offer him food in order to allow his stomach time to settle down. He then vomited five more times throughout the morning and seemed very lethargic. After two hours, Curry wouldn’t get up, so his owners brought him immediately into Friendship. When Curry arrived at the hospital, he was in shock and still unable to stand. We immediately placed an intravenous catheter and started fluids. Curry was unresponsive to any stimulation and his abdomen was tender and painful to the touch. His blood sugar and blood pressure were both very low. This combination of symptoms can indicate sepsis -- an overwhelming infection in the blood stream and tissues. What puzzled me was how he went from being one hundred percent normal to critical in less than twelve hours. We administered medications to bring up Curry’s blood sugar and raise his blood pressure. Curry’s blood pressure was of special concern; since there was a chance his organs were not receiving enough blood to properly oxygenate them. Soon Curry was able to sit up, but was still very weak and unable to stand. Bloodwork was our next step: We were looking for an increased white cell count or a metabolic cause to explain his condition. 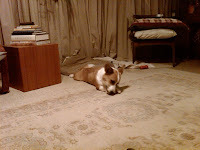 Another possibility was that Curry’s state was caused by something he had eaten: either a toy or a toxin. However, his owners are very attentive dog “parents” and hadn’t noticed him eating anything out of the ordinary. Fortunately, Curry was now stable enough to have abdominal x-rays taken. These revealed that his entire small intestine was dilated with gas which could indicate an obstruction or decreased motility in his gastrointestinal tract from an unknown cause. Though my initial concern had been neurologic disease, Curry had improved so much after the fluids that my suspicions now shifted to primary gastrointestinal disease. His owners and I discussed going to surgery immediately versus waiting to see how he responded to medical management. Because Curry was now sitting up and able to walk, (although pain medication had only slightly dulled his abdominal discomfort) we decided to hold off on surgery for the time being. He was admitted into the hospital while we waited for the bloodwork and to see how he responded. Thanks to Friendship’s in-house, state-of-the-art laboratory I would have these results back shortly. Just as his owners were about to leave, Curry vomited a massive amount of fluid which immediately changed my mind about waiting. We quickly decided that he needed an abdominal exploratory surgery to determine what was going on. Curry was immediately sent to surgery and while we were shaving his abdomen we discovered what was making him so sick. He had a large, firm swelling between the top of his inner thigh and his belly, an area known as the inguinal region. This was a clear sign of an inguinal hernia: a tear in the body wall, which had remained benign until a piece of intestine slipped through the hole and became trapped. We do not know what caused the tear and there was no way for his owners to suspect this had happened until Curry started showing clinical signs. The danger occurs when the blood supply to that section of intestine is restricted and the tissue begins to die. If this condition had been left untreated for much longer, Curry would have died, so I was very happy that we had decided to be aggressive and go to surgery immediately. Once in surgery we removed the dying piece of his small intestine from the one inch tear in his body wall. About four inches of intestine had turned black and would need to be removed. We cut out the diseased intestines and sewed the healthy tissue back together, in a procedure called a resection and anastamosis. To prevent this from happening again, we also closed the tear in Curry’s body wall. Curry responded amazingly after his surgery and was able to go home two days later. His owners tell me that he is doing great and one would never know the ordeal he had suffered. He is lucky that his owners were so attentive to his behavior and brought him into the hospital immediately. Since Friendship is equipped to perform surgery at any time we were able to act quickly, saving his life. I always enjoy seeing Curry, his sister Lily and his wonderful owners whenever they visit the hospital. Really interesting to be walked through a differential. Glad the little guy is OK!